Galaxy Note4: How to use selective focus in the camera? 1 Tap the MODE icon to change to the Selective focus. 3 Tap and select the objects you want to be in focus. Add depth to your pictures by adjusting them so that only the objects you want are in focus. For the best results, make sure your subjects are less than 50cm away from you, and at least twice as far from the background. Select the Camera button to take picture. 4 Shooting is processing and picture is taken. 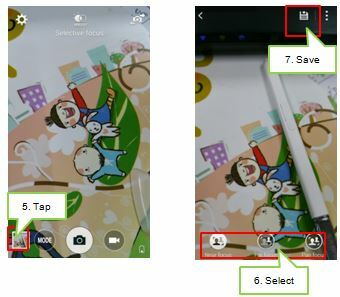 5 Additionally, you can do refocusing through Gallery after shooting picture. Tap the Gallery option. 6 You can select focus which you want on taken pictures. Choose the Near focus or Far focus or Pan focus. Near Focus is basic default result which focused on near object, and Far Focus is objection of Near focus. Galaxy Note4: How to capture images by Selfie Mode using the Rear Camera? Galaxy Note4: What are the camera features? Galaxy Note4: How to take images by selfie mode with beauty face using the front camera?